If you don’t believe you learned at least one idea from the book that you can implement to increase your business by thousands of dollars then return the book within 30 days for a refund. AJ has taken proven ideas and laid them out in simple and practical terms in this “how to” book. This is a must read for anyone in the business looking to improve their company’s results. AJ does a great job of compiling a ton of programs into one document and then giving you the detail to implement those ideas. And beyond just making more money, some of these programs will help you build a long term identity in your market which I believe is needed to help build a sustainable competitive advantage. Great job AJ! As Director of DRB Systems Support and Service, I can say that AJ Rassamni’s book hits on several important topics that our Support department consults with Car Wash operators on a daily basis, allowing them to improve their business strategy and revenue. The books focus on “there is no exception for excellent service” is definitely part of DRB Systems Support’s mission statement and should be part of all Car Wash organizations missions statement as well. 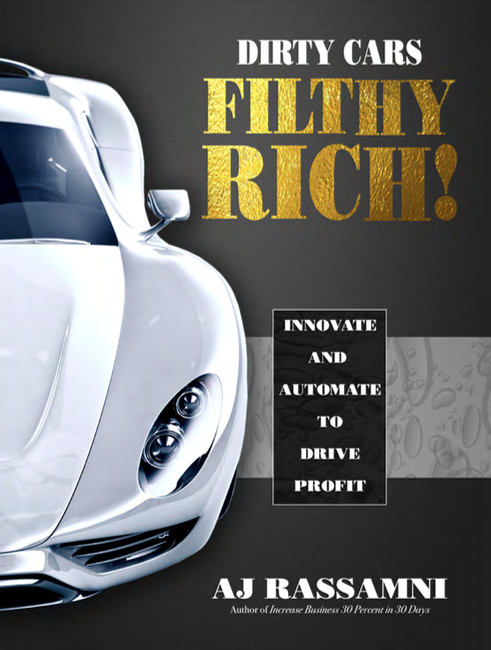 I would recommend this book for owners new to the car washing industry as well as those seasoned Car Wash operators. — Dane Vough, Director Customer Support and Service DRB Systems, Inc.
AJ has done a great job of offering ideas on increasing profits at a car wash. The book is a great tool for both newcomers and established owners to train new employees, as well as continuing education with existing employees. The sales training section alone is worth the price of the book. Nice Job. 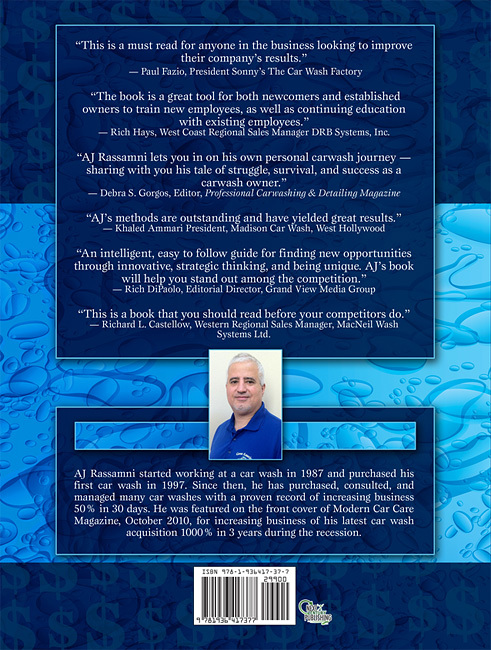 — Rich Hays, West Coast Regional Sales Manager DRB Systems, Inc.
AJ Rassamni lets you in on his own personal carwash journey — sharing with you his tale of struggle, survival and success as a carwash owner. 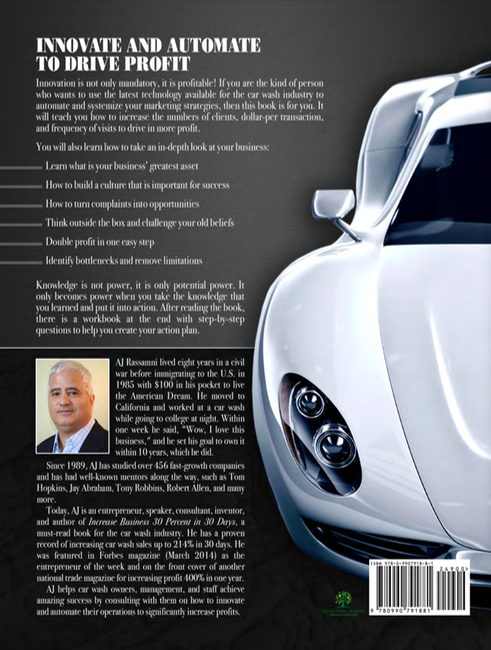 He offers the tips and tools any owner should know and use; and shares with you the mistakes to look out for and ultimately avoid. AJ’s methods are outstanding and have yielded great results. Any car wash operator will improve his business by following AJ’s methods. Shared through real experiences of success, AJ Rassamni’s book is an intelligent, easy-to-follow guide for finding new opportunities through innovative, strategic thinking and being unique. Whether you are looking to start a new business or enhance an existing business, the thought-provoking advice found in AJ’s book will help you stand out among the competition. 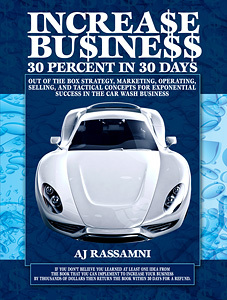 AJ’s book Increase Your Business 30 Percent in 30 Days is a “hand book” that will provide the reader the keys to success if they will read it and implement the ideas and process provided to them. Additionally, implementation of those ideas will distinguish them from their competition. Besides being well written, the book is very timely for those looking for ways to survive the tough economic times we are experiencing. Over the last 30 plus years that I have been in the car wash business, I have watched great successes and seen far too many failures. Successes were achieved because of many factors. AJ’s book covered a great number of procedures, methods and mind-sets necessary to be one of those success stories. — W. Herschel Kilgore Vice President Tunnel Sales & Development SCWS, Inc.
AJ's book Increase Business 30% in 30 Days should be required reading for 70% of current operators and 100% of those thinking of entering the industry. If I were a car wash lender I would make this book required reading for any prospective borrower. If every operator adhered to the principles laid out in this book there would be far fewer foreclosures in this business. If your car wash is sinking, this book could very well be your lifeboat. AJ's book is filled with simple ideas that can have a profound effect on your overall success and make you the leader rather than the one playing catch up. If you only take one thing from this book, it will be worth the investment. This is a book you should read before your competitors do. — Richard L. Castellow, Western Regional Sales Manager, MacNeil Wash Systems Ltd.
© AJ Rassamni. All Rights Reserved. Website Developed by WebCity Press.